Would The Youths Be Given The Opportunity to Run in Nigeria? A Public Debate with Citizens on Independent Candidacy and Age Reduction in Nigeria’s Constitution. The dilemma of youths being given the opportunity to run has been disturbing overtime, as such it is high time this question gets a concrete response with strong constitutional backing. The timing for the “Not Too Young To Run Campaign” came just in time considering the state of the country at hand, the maturity of the democracy and the global context when it comes to sustainable development. It is noteworthy of the fact that the youths in Nigeria are the most marginalized and segregated subgroup and on some certain set of people in the country irrespective of region, religion or tribal origin. On Wednesday, June 29, 2016 at Barcelona Hotel, Blantyre Street, Wuse II, Abuja by 9:00 am stakeholders would rally around mobilizing and engaging citizens to air their opinions, both for or against the bill which has passed second reading at the house of representatives which is now with the Committee on Constitution Review. In Nigeria with a vast population of over 60% youth, one tends to find out that the most popular duty of a young Nigerian is to vote while the older ones engage, advocate and of course contest and compete for political positions. Other activities of Nigerian youth are seen around offices as Personal Assistant (PA) to political office holders. Civil Society Groups canvassing for the Not Too Young To Run Bill at the National Assembly, perceives that this marginalization process has grown gradually, as it can be regarded as deadly as cancer which does not kill immediately, but moves like a slow poison. Inclusion and participation are twin principles that underpin constitutional democracy. These principles indicate democratic development in any given society. In other words, the vitality of democracy is hinged on the level and quality of citizens’ participation in the process. To this end, democratic processes or systems must be open and easily accessible for citizens to participate. Political alienation and marginalization is not only anti-democratic but a recipe for political instability. If passed into law, the Bill will seek to alter the Section 65, 106, 131, 177 of the 1999 Constitution of the Federal Republic of Nigeria (as amended) to reduce the age qualification for the office of the President from 40 years to 30 years; Governor 35 to 30, Senate 35 to 30, House of Representatives 30 to 25 and State House of Assembly 30 to 25 respectively; as well as mainstream independent candidacy into Nigeria’s electoral process. 1) Liberalizing the age requirements for contesting elections in Nigeria: A yes or No? 2) Getting Independent candidates on the ballot in Nigeria: Hope or doom for the electoral system? 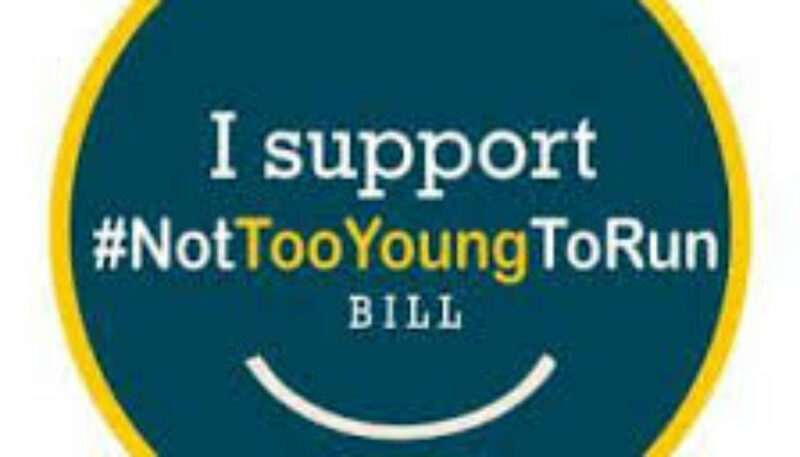 The public debate for #NotTooYoungToRun Bill will assemble seasoned panelists who will provide supporting and opposing arguments for the Bill. In addition, it will present two contrasting arguments for the Bill which is poised to decide the future of the country. Group faults government poor management of lead contamination in Shikira	Group seeks partnership with CODE on Stop don’t Drop campaign.